The National Organic Standards Board (NOSB) is in the process of reviewing a number of crop, livestock, and handling inputs currently allowed for use by certified organic operations. These production and handling inputs (commonly referred to as the National List of allowed and prohibited substances) will be reviewed by NOSB based on their “Sunset” review timelines, and may not be renewed if new information indicates these substances are incompatible with organic production. Your feedback is critical, and will significantly help shape OTA’s comments to NOSB. Every household needs a good toolbox and a well-stocked first aid kit to deal with unexpected challenges that can’t be handled in the usual way. And so it is with organic agriculture. Many consumers believe that absolutely no synthetic substances are used in organic production. For the most part, they are correct and this is the basic tenet of the organic law. But there are a few limited exceptions to this rule, and the National List is designed to handle these exceptions. The National List can be thought of as the “restricted tool box” for organic farmers and handlers. Like the toolboxes or first aid kits in our cupboards to deal with critical situations when all else fails, the organic toolbox is to be used only under very special circumstances. The organic farmer’s toolbox contains materials that have been traditionally used in organic production. By law, they are necessary tools that are widely recognized as safe and for which there are no natural alternatives. This toolbox is much smaller than the “full-toolbox” used in conventional farming. 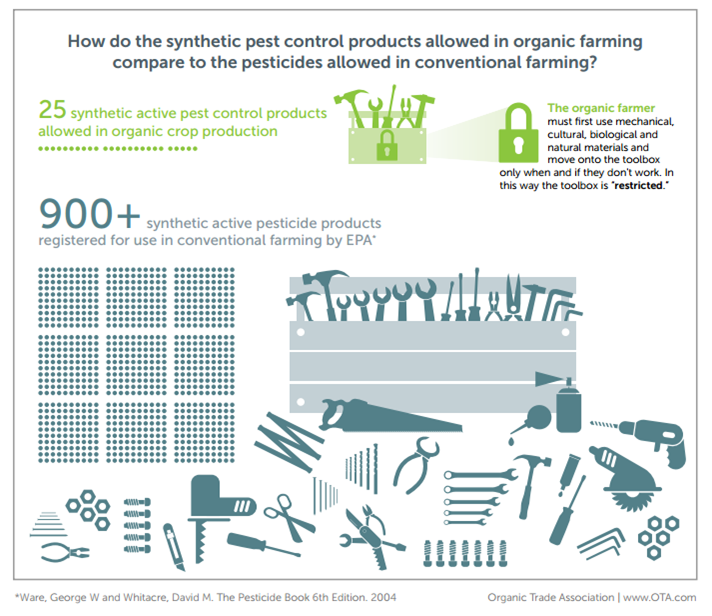 Organic farmers have restricted access to 25 synthetic active pest control products while over 900 are registered for use in conventional farming. 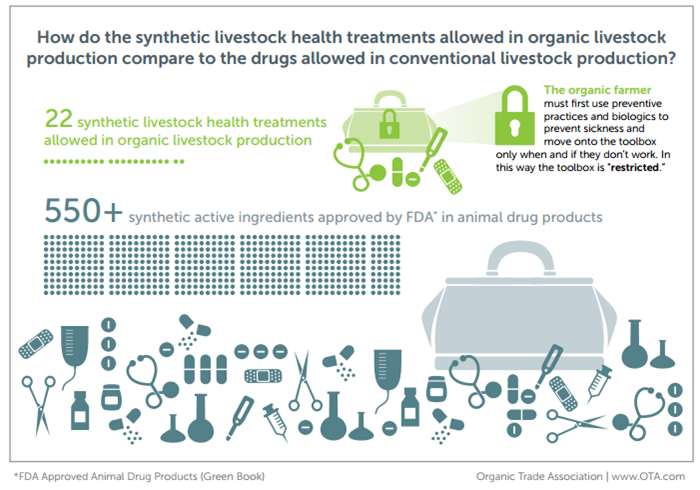 Organic ranchers have restricted access to 22 synthetic livestock health treatments, while over 550 synthetic active ingredients are approved in conventional animal drug products. The restricted toolbox can only be opened when mechanical, cultural, and biological controls are insufficient to control pests, weeds and disease. This is foundational to organic farming. It was 1997 and the National Organic Program (NOP) as we now know it was still evolving. On December 16 of that year, the first proposed rules to establish national organic standards were published by the NOP, erupting a roar of public discourse. The Department of Agriculture, which had just begun overseeing the National Organic Program, was swamped with over 275,000 public comments on the proposal, and the public interest in organic has only intensified since. Today’s strict and comprehensive network of federal requirements and regulations that monitor and check the organic industry, from the farm gate to the dinner plate, was born out of a public outcry that started rumbling in the 1970’s for a healthier and safer agricultural system that would not endanger the environment or pose risks to human health. That public sentiment culminated in the Organic Foods Production Act in the 1990 Farm Bill which ultimately created the current rules for the entire system of certified organic agriculture in the United States. The National List identifies the synthetic substances that may be used in organic crop and livestock production, and prohibits the use of certain natural toxic substances in organic production. The list also identifies synthetic materials such as carbon dioxide, non-synthetic non-agricultural substances such as yeast, and non-organic agricultural substances, such as Turkish bay leaves, that may be used in organic handling and processing. It took five years for the National Organic Standards Board (NOSB), a group of fifteen public volunteers appointed by the Secretary of Agriculture who represent various sectors of the organic industry, to complete a massive review of the inputs in use by organic producers and processors, and of state, private, and foreign organic certification programs to help craft the final organic regulations. It was from this extensive research and engagement with everyone in the organic chain, and following thousands of comments to federal regulators, that the National List was compiled, reworked and reworked again, and then officially established on Dec. 21, 2000. The list mirrored most of the standards that organic producers and handlers were already abiding by through the various certification programs of the time, and was formulated to be flexible enough to accommodate the wide range of operations and products grown and raised in every region of the United States. What are some of the allowable substances on the National List? For crop producers, the list includes things like newspapers for mulch and sticky traps for insect control. For livestock producers, it includes vaccines, an important part of the health regimen of an organic animal for which antibiotics are prohibited, and chlorine for disinfecting equipment. 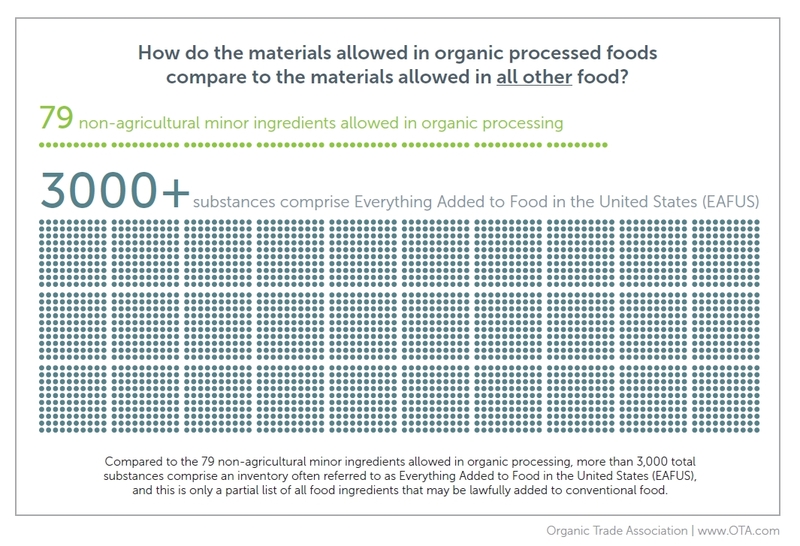 For organic processors, the list includes ingredients essential to processed products that can’t be produced organically, like baking soda, and certain vitamins and minerals and non-toxic sanitizers. Not all the allowed items on the National List are non-controversial of course. But all of the substances on the list are required to fulfill three critical criteria as specified by the Organic Foods Production Act: 1) Not be harmful to human health or the environment; 2) Be necessary to production because of unavailability of natural or organic alternatives, and 3) Be consistent with organic principles. From its onset, the structure of the National List has encouraged public input and was designed to reflect changes in organic production and processing, and developments in environmental, health and agricultural research. The list is not a static list; every five years substances on the list are reevaluated by the NOSB to ensure that new information has not emerged that should change their status, or if a natural or organic alternative has become available. The entire review follows a several-step process that encourages public participation. This is referred to as the Sunset Review Process. The public plays an essential role in the National List process, and the organic community has direct input. Any interested party can also petition to the NOSB to review a specific substance, and remove it or add it to the list. The first several years of the implementation of the list were a period of fine-tuning, adjustment and just plain learning. Some materials essential to safe organic production had been overlooked and were added, like ozone gas for cleaning irrigation systems and animal enzymes for organic cheese production – both put on the list in 2003. In 2007, the number of non-organic agricultural ingredients allowed in organic processed products was dramatically tightened. Processed products with the organic label must contain 95 percent certified organic ingredients. Before 2007, the agricultural ingredients that could be used in the remaining 5 percent category were not spelled out; ANY non-organic agricultural ingredient could be used if it was not available in organic form. In 2007, 38 specific substances were defined and added to the National List of non-organic ingredients allowed in a processed organic product. So with the addition of 38 materials to the National List, what had been an unlimited number of non-organic agricultural ingredients allowed in organic processed foods was reduced to a closed list of just a handful. 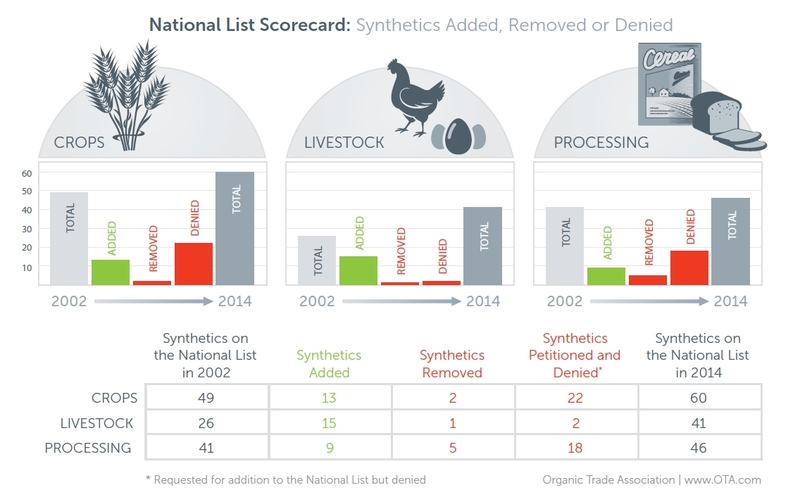 Since 2008, an even greater shift away from synthetics has occurred, with just five synthetics added to the list, and a total of 44 during that same time period removed, denied from the list, or further restricted. The synthetics added include a sanitizer in processing facilities used only for secondary and indirect food contact, a cheese wax used for organic mushroom production, a mite control product for organic honey production. Substances no longer allowed in organic products or denied permission to be added include non-organic hops in organic beer, bleached lecithin, unmodified rice starch and dozens of synthetic substances and other materials. Additional restrictions recently added include a requirement to use organic yeast in certified products for human consumption and a requirement to use organic colors. 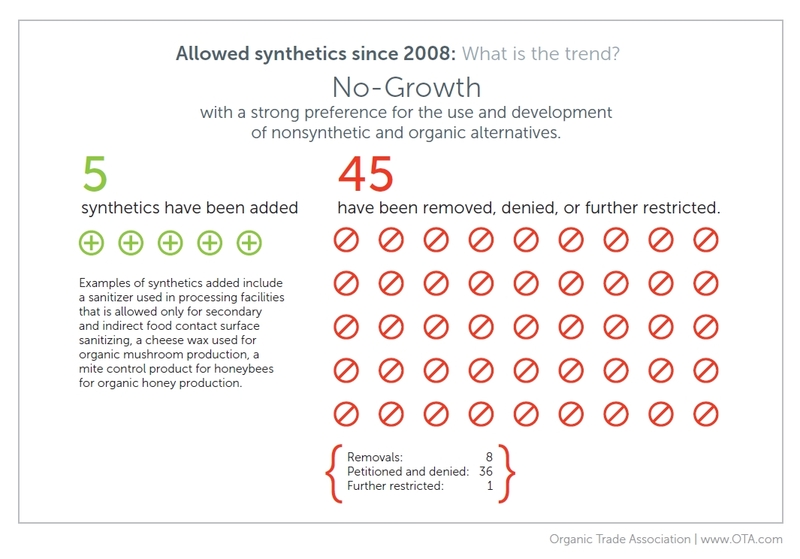 The no-growth trend in synthetics since 2008 shows a strong preference for the use and development of non-synthetic and organic alternatives. A real-life example of a determined individual working within the NOSB system to replace an allowed synthetic material on the National List with a certified organic substitute occurred just last year. The head of the company, which makes rice-based ingredients that food manufacturers use as alternatives to synthetic ingredients, submitted a petition in 2010 to remove silicon dioxide from the National List since his company had developed a rice-based certified organic alternative to the synthetic. In 2013, the NOSB amended the use of silicon dioxide and weighed in favor of organic rice hulls when available. The system was more arduous and took longer than expected, but it worked. 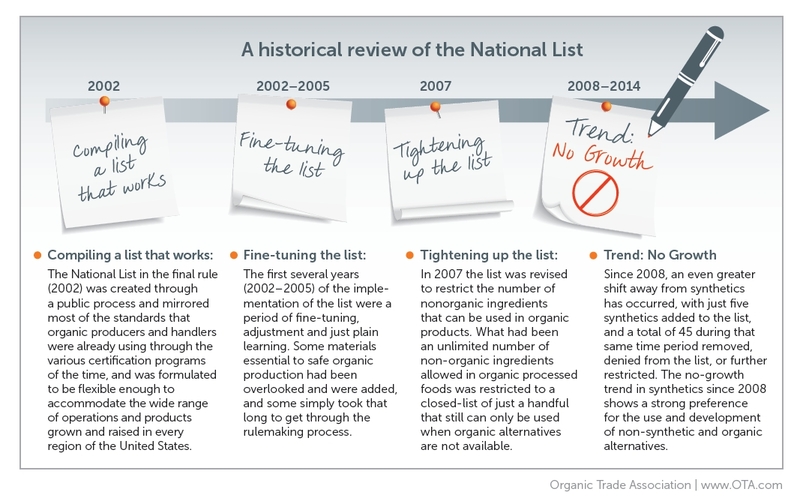 It was proof that the National List has the foresight to include synthetic ingredients when there are no organic or natural alternatives, and thereby enabling the organic industry to evolve and grow, but more importantly, the system provides a method to retire a synthetic substance and implement the organic alternative when it becomes available. And in the particular case of the maker of the rice-based organic alternative, it was a win-win deal for the company, with sales growing by over 150 percent! The National List represents a process that is rigorous, fair and one that works. It reflects realistic organic practices, while taking into account current obstacles to ideal production. It encourages public scrutiny, comment and engagement. In the last ten years, organic food sales in the United States have jumped from around $10 billion in 2003 to over $30 billion in 2013, a 300 percent growth explosion. The number of certified organic farms in the country, according to USDA’s recently released 2012 Agricultural Census is approaching 13,000, compared to 3,000 tops in the mid 1990’s. More certified organic farmers, more organic products, more organic processors and handlers, an organic farm to table supply chain that is growing every day, but still adhering to a tight set of stringent guidelines – that’s what the National List has made possible.